Between getting off work and the 7:00 start time, I managed to find entries for the color and b&w print categories, plus two for the projected category. Hasty edits and crops and an even hastier dash to Walgreens to pick up the prints and race to the meeting. Our presenter this evening was a renowned Missouri photographer who has exhibited in the White House and published several books. When the contests started, one of the club officers asked him if he would critique the entries in projected category, THEN asked if entrants had any objections. Heck YES, I have objections. Heck NO, I’m not going to voice them. The gentlemen informs us that he is a gentle critic, only harsh when his students obviously started preparing at the last minute. Nuts! Fudge! Other exclamations that I do not allow my children to use so I try to avoid using as well! Fortunately mine are toward the end. Most of his critiques involve cropping. I can handle cropping. I like to crop. No – I live to crop! First entry: needs cropping. Does not mention how woefully overexposed it is (thank you very very much). Second entry: he likes it! He really, really likes it! 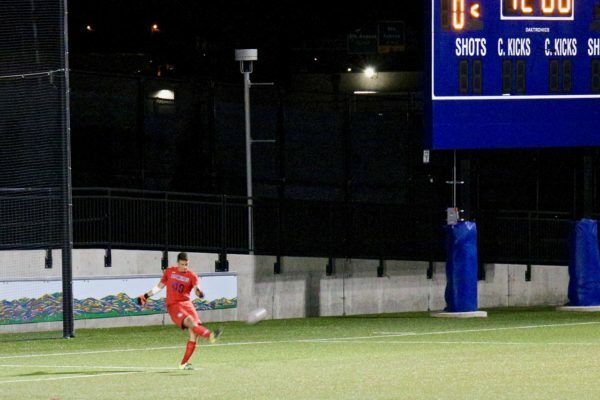 The red uniform of the soccer player grabs your attention and is complemented by the blue scoreboard, which he is happy is not cropped out. The green grass provides a neutral background (although a little could be cropped out, I’m going to pretend I didn’t hear that). The graffiti provides a counterpoint to the information on the scoreboard and the black background shows that this is after all an athletic event taking place at night. His final comment: this is not the type of photo that is published in the newspaper the next day, but it is the type to win the contest at the end of the year. Fortunately mine are toward the end. Most of his critiques involve cropping. I can handle cropping. I like to crop. Make that . . . I live to crop!